According to Gier Friisoe, division director for plant protection with the Minnesota Department of Agriculture, the state intends to release wasps as a biological control agent to help fight the Emerald Ash Borer infestation in the Twin Cities. When most people think about wasps they think of stings. With these wasps, the only species that needs to worry are the Ash Borers. As reported on Minnesota Public Radio, Friisoe said, "In China, where emerald ash borer [are] native, some of these stingless wasps have been shown to parasitize up to 90 percent." A similar experiment began in Michigan in 2007 and Indiana in 2008. Cliff Sadof, Purdue professor of entomology was quoted in 2008 as saying, "In China, these wasp species reduced EAB populations by 74 percent in ash trees that are native to North America." Not quite as impressive as the 90% figure thrown out there by Friisoe but a huge step in the right direction none the less. The wasps can sense the beetle larve under the bark of the ash trees and they lay their eggs inside the beetle larve or inside the eggs which kills them. When will the wasps be introduced? According to Minnesota Agriculture Department spokesman Michael Schommer there's no timetable for introduction. Wasps have already been released in Michigan and as noted above, Indiana, but it is too early to say how effective they will be. In all cases, no one is sure if our cold winters will kill the wasps. That would be a huge problem since the Emerald Ash Borer doesn't seem to mind the cold. There isn't much information available as to what species are being used for these experiments. I was able to dig up a study published in The Great Lakes Entomologist, titled, "Exploratory Survey For the Emerald Ash Borer, Agrilus Planipennis (Coleoptera: Buprestidae), and its Natural Enemies in China." Two of the possible parasites for Emerald Ash Borers are Spathius sp. and Tetrastichus nov. sp. 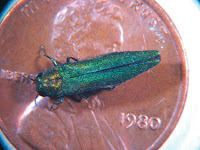 Spathius wasp larve feed on Emerald Ash Borer larve and kill them. They fed by inserting their mouth hooks through the body wall of the Emerald Ash Borer's abdomen. Several larve may attack each borer larve. The adult wasps are 3.5 to 4.5 mm long. Tetrastichus larva, by contrast, actually kill the borer larve from the the inside out. The Tetrastichus adults are also tiny, only 2.5 to 5 mm long. It will be interesting to see if this biological control pans out in the long run. The ash borers certainly aren't going anywhere soon. So, the DNR is going to be legally liable when we who are deathly allergic to wasps are stung? Yes, also not the DNR, that was a mistake I corrected right away but the original title still went out for distribution. While stings are not an issue there can always be unintended consequences of introducing an exotic species. This is, of course, what got us into this mess in the first place. the research seems to suggest though that these wasps will not be a problem.